My parents were converts to peace and holiness. My father grew up in a family that was anything but peaceful. Growing up my father told many stories about his family. On one occasion, after my grandmother received a black eye from my grandfather, my father and uncle warned Grandpa Yeatts: that must never happen again to their mother. When my father lived with his brother as a young man, he got a phone call in the middle of the night that his brother had been in a bar fight, and when my father arrived at the scene, he found my uncle had been hit over the head with a tire iron from which he developed a severe bruise over most of his head. The family suspected he received permanent brain damage. That injury was used to excuse my uncle’s violent, irrational temper. On another occasion, my uncle awoke from a bar room fight to find his suit coat sliced through to the skin. Years later, my uncle was attacked by young men who intended to rob him but left when they realized this was my cousin’s father. That night, my uncle decided to no longer frequent bars, but instead he purposed to drink at home where he would be more safe. My father was converted from that violent family into the peace-loving Brethren in Christ, in a tent meeting under the ministry of Arthur Climenhaga. Then he was discipled by Bishop O.B. Ulery, one of our denomination’s leading proponents of both peace and holiness. People in my home congregation would say: “If you want to find Bob Yeatts—my father—just look for O. B. Ulery, and Bob will be there. Although I was born one year after O. B. Ulery died, his shadow loomed over my home and congregation. Bishop Ulery walked on water in my household. I am still a good friend of his grandson David Ulery and his granddaughter, Beth Saba, who with her husband Costandy Saba pastor my home congregation in Springfield, Ohio. After World War 1, Ulery questioned the idea that those who had given their lives in the war had done anything to establish democracy or hasten the coming of Christ’s kingdom. Ulery challenged the basis for that very popular war. The Brethren in Christ message of nonresistance taught by O. B. Ulery was particularly attractive to my father. His conversion to the peace position led my Dad to refuse to make war products on his machine in the factory during World War II. He was hated for his stand against that war—the war most often has used today to support the just war theory. I took up my father’s peace witness during the Vietnam conflict. I submitted conscientious objector papers to my draft board when I turned 18. Recently I reminisced with my cousin about our experience with Draft Board #13 in Springfield, Ohio, which was written up in those years in Look magazine as an example of our outdated selected service system. 4] I remember vividly my meeting with that group of old men on my draft board, who were suspicious of us young “draft-dodgers.” That board never granted conscientious objector status to anyone during any war, and my request was rejected unanimously so that I had no appeal. While I was deferred as a student, I attended Messiah College where my opposition to war was nourished by Brethren in Christ faculty like Carlton Wittlinger, Martin Schrag, and Morris Sider. Yet, when my student deferment ran out, because I crammed four years of college into five years, I was classified 1-A and ordered to report for induction into the United States Army. I went for my military physical, prepared to step out of line and refuse induction. It never came to that, because I was surprisingly informed by the clerk of my draft board about a 1-SC student classification that would last until the end of the academic year, when I was enrolled in seminary. In seminary I circulated a petition against the Vietnam conflict in the Presbyterian Church where I served, attended an event in the Princeton University Chapel when students voted to go on strike in protest of President Nixon’s invasion of Cambodia, and was present on another occasion in Princeton Seminary Chapel where a student burned his draft card. I did not strike, nor did I burn my draft card, yet I was sympathetic with this secular anti-war movement although my position had different roots. I have always considered myself a biblical pacifist. During seminary, I was tempted to leave my peace church to become a minister in the Presbyterian Church. I’ll always be grateful to Bishop Charlie Byers for staying close to me and even visiting us in Princeton. After seminary, Bishop Byers convinced the board of the Fairland Church (Cleona, PA) to accept this 25-year-old seminary graduate to be the only pastor of a congregation with about 200 regular worship attenders. My first year at the congregation, I invited the peace team from Messiah College to conduct a Sunday evening service, during which one of the students advocated voting for the peace candidate—George McGovern. I doubt she convinced anyone in that staunchly conservative community. Some of the members of the Fairland Church were not happy with this peace team from our denomination’s college, but fortunately they did not translate that dislike to me, and I had a rewarding five-year pastorate at Fairland. After attending graduate school, I taught for 33 years at Messiah College. During that time, I went to Washington to lobby on behalf of the Peace Tax Fund, which would allow biblical pacifists to redirect their tax money from the military budget. Surprisingly, the conservative Republican Representative Bill Goodling from our district said he would not vote against the Peace Tax Fund because of the many peace churches in his constituency. I believe my upbringing among the Brethren in Christ and my experience at Princeton Seminary were ideal preparation for teaching at Messiah College, sponsored by our historic peace church. My peace testimony was welcomed by the college and at least tolerated by students. After a teaching career at Messiah College, I spent the last five years at the Grantham Church. In a sense, I believe that my entire career was to prepare me for my ministry there, because in those years my peace witness moved from the political to the interpersonal and even the spiritual. In a congregation that was torn by strife, Bishop Ken Hoke called me to bring peace, first as an interim preacher and then as senior pastor. This was a far greater test of my peace witness than the Vietnam Conflict. Here biblical pacifism was put to the test in interpersonal relationships within the Grantham Church and in its witness to the community. At Grantham, I humbly believe that God called me to be a peacemaker so that God could bring healing and wholeness. I watched as God miraculously worked through too many situations to describe here to bring healing and prepare the congregation to grow remarkably in the last year under the leadership of Pastor David Flowers. Peace churches must do more than renounce war; they are called to witness to the world about the peace that God can bring between people. God has done that in the last five years at the Grantham Church, and I have been blessed to watch God at work. Indeed, I am greatly blessed to be the product of an Anabaptist peace church. But that is not all that the Brethren in Christ is. We are also a holiness church, and I was nurtured in one of the hot beds of holiness—Beulah Chapel in Springfield, Ohio. Here again the story begins with my father. He grew up in a family where alcohol was a problem. Men in the family worked hard all week and then got drunk on Friday only to sober up on Sunday afternoon and return to work on Monday morning. My father grew up in that alcohol-ridden family, so holiness was very attractive to him. My father’s mentor, O. B. Ulery, was a champion of second work holiness throughout his ministry as a Brethren in Christ bishop, pastor, and evangelist; as the denomination’s general secretary; and as the publisher of the church paper, the Evangelical Visitor. As a proponent of holiness, my father’s mentor, O. B. Ulery, was thrilled when he heard a holiness camp was to be launched at Roxbury. He gave a liberal financial gift, preached the dedication sermon, built one of the first cottages—Beulah Cottage—and served as the Bible teacher at the camp every year except one when sickness prevented him. Among Ulery’s last acts was laying the cement blocks for the first building and preaching the dedication sermon for Memorial Holiness Camp in southern Ohio. As a child, I attended Memorial Holiness Camp Meeting every summer. My parents talked often about Roxbury, so I was in awe when one year, we came to the legendary Roxbury Holiness Camp. Many Brethren in Christ have attended Roxbury annually as part of their summer vacation. How they put up with the sweltering Pennsylvania heat in August has always been mystifying to me, especially before air conditioning. At Memorial Holiness Camp where I attended, the preaching style varied. There were the guilt-inducing messages of William Rosenberry; the sermons of his brother John, punctuated with his running the front of the church, jumping the altar rail, and once even vaulting the pulpit; the scary stories of Harry Hock’s time with gangsters in Detroit; the inspiring stories from the life of Henry Ginder; the explanations of holiness from the more cerebral Luke Keefer, Sr.; and the accent of Charlie Byers that I could never place—not Pennsylvania Dutch, but what was it? I remember the altar calls with appeals that motivated my friends to flock to the front, where there was crying for sin and shouting when the seeker prayed through. As exciting as those altar services were, I learned to resist the invitation, in order to spend time with my friends at the snack bar after church, where small glass containers of ice tea and pints of ice cream cut in half were more attractive than weeping at a mourner’s bench. I remember fun times in the children’s camp with teacher Pearl Wolgemuth and chorister Avis Brumbaugh. Sister Pearl did Christian magic, once administering black disappearing ink to my white shirt, which I wore around camp so all could see my sin-stained shirt become white as snow. Experiences at Memorial Holiness Camp were mirrored in my home congregation. Pastor Dale Ulery shouted when people were delivered from sin. When I preached at Roxbury, John Rosenberry introduced me with the story of my mother playing the organ, getting blessed, leaving the organ to circle the church shouting, only to arrive back at the organ bench and continue playing. Although it did not happen at Memorial Holiness Camp, I did witness to an experience of sanctification, at the end of a regular service under the preaching of my childhood pastor Owen Alderfer. Owen also baptized me in a stream behind the Osterlan Home in Springfield, Ohio, and Owen was the department chair when I first came to teach at Messiah College. Owen helped me to deal with my ambivalence regarding holiness. Indeed, I must admit that my observations of second work holiness have been mixed. Holiness seemed to work for my father. I am blessed to have had a father who modeled a holy life. I observed him at home, and for five summers worked with my father in a factory. He lived what he professed, at home and at the factory with his fellow workers. He did not wear his plain coat on the job, but they knew of his commitment. I cannot really think of much to criticize in my father. Nevertheless, I do not think holiness was good for my mother. She was quite introspective and spiritually sensitive about her relationship with God and other people. She prayed for missionaries, taught a Sunday School class for teenage girls, and was deeply devoted to her Brethren in Christ Church. Yet, holiness seemed to instill in her anxiety rather than peace. When I shared my love/hate relationship with second work holiness with Owen Alderfer, he said: “This second work of grace may have its theological problems, but we holiness people are not comfortable with sin, and we believe that it is important to live a holy life.” He was right. I was told that my Baptist great-grandfather used to say, “I sin every day in thought word and deed, but I am ‘borned again’ and on my way to heaven.” We holiness people believe the eternal security Baptists are too comfortable with sin. As much as we fail and even fall into sin, our goal is holy living. So, we Brethren in Christ are people of peace and holiness. I have recounted how this unique combination of beliefs has influenced me. Peace and holiness have been central to our church throughout its history and are also relevant today. When violent language is a regular part of political speech and actual violence is in the news daily, we need the Brethren in Christ message of peace. At this time of disregard for truth and moral values, the world needs the Brethren in Christ message of holiness. 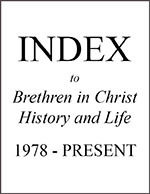 Our somewhat unique combination of peace and holiness makes the Brethren in Christ Church relevant in the twenty-first century. This article is adapted from John’s talk at the Annual Heritage Service at the Ringgold Meetinghouse in Ringgold, MD on June 4, 2017. E. Morris Sider, Nine Portraits: Brethren in Christ Bibliographical Sketches (Nappanee, IN: Evangel Press, 330. Anthony Wolff, “Draft Board No. 13, Springfield, Ohio,” LOOK Magazine, April 2, 1968, 28-32. John R. Yeatts is professor of the psychology of religion emeritus at Messiah College and pastor of congregational care at the Grantham (PA) Church. Read more articles by John R. Yeatts.